In this post, we will explore a very common Hibernate error, namely a MappingException caused by missing annotations on the Entity getters and fields. Now let us take a look at the code. The implementation contains two entities. The first entity is the bank account entity. The second entity is the transaction entity. Each bank account has two many-to-one relationships with the transaction table. A bank account has a list of transactions where it is credited, and a list of transactions where it its debited. Sadly the information in the stacktrace is not very straightforward. It is telling us that the mapping between the Bank account and the Transaction table for the “credit_transactions” relationship is not correct. Hibernate does not understand the “credit_transactions” field. The issue is that we have added annotations in the BankAccount entity on the fields and the getters. Notice that we added the @Id and @GeneratedValue annotations on the id field in the BankAccount entity. However, we added the @ManyToOne annotation for our relationship on the getters. If we add the @Id annotation on the getter and the @ManyToOne annotation on the field, then we will get the same error. This means that hibernate will consider only the annotations that are set on the same side as the @Id annotation. So if you add the @Id annotation on a field, then only field annotations will be considered. If the @Id annotation is set on the getter, then only annotations on the getters will be considered. Adding the annotations on the entity fields is called “Field” access type. Adding the annotations on the entity getters is called “Property” access type. 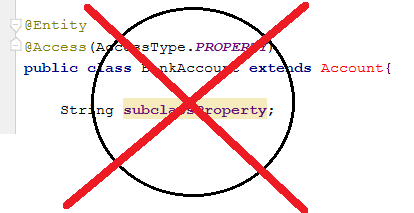 You can override JPA’s default behavior by setting the access type property of the entity.